The sun is out after a few days of grey skies and rain, so I went a little crazy with extra bright and bold colors! 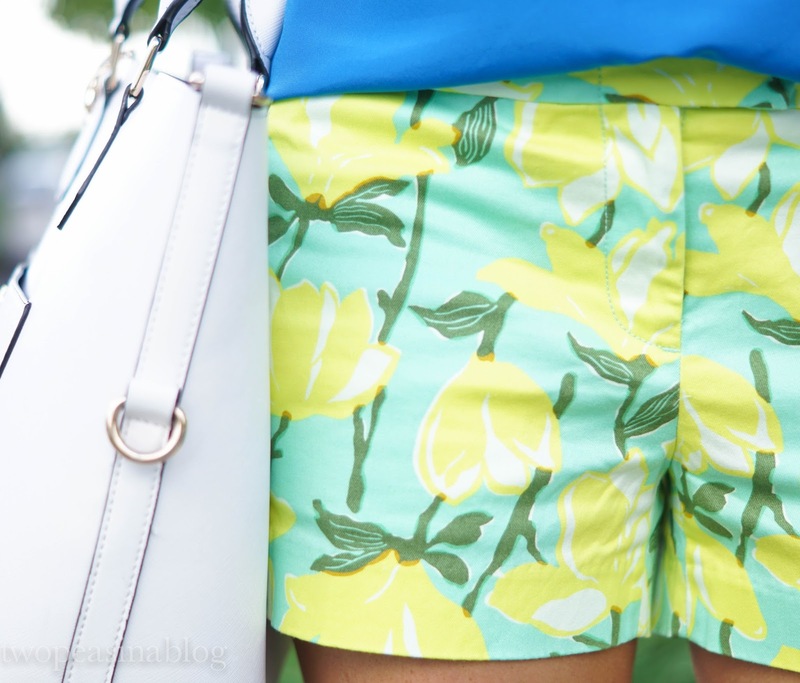 This is my type of go-to shorts outfit all summer long! Bright bold shorts and a sleek cami create a polished yet easy to wear outfit. In case you missed it, this week we've been sharing easy ways to get quick, pulled together outfits from Wednesday's post on 5 tips to look pulled together to yesterday's post that was full of weekend casual wear. Speaking of looking your best, taking care of our hair is right up there with face care and quality make up. (Posts yet to come!) A couple months ago, I took the advice of a dear friend and tried a new hair salon. While I chose a different stylist to go to than her, I was excited to lighten my color for Summer. I've had an ombre color done before so I knew exactly what I was asking for and even showed multiple pictures of what I wanted. Four hours later, and 2 hair treatments, I left disappointed and with an appointment to come back the next day for a re-do. This time with a different stylist. Well that didn't work and the coloring still looked way off. Luckily, the head stylist was able to get me in the next day. She was a miracle worker and "fixed" the problems. Not perfect, but on the track of looking as an ombre style should. Needless to say, after ALL these hair colorings back to back, my hair took a beating. It has been incredibly dry. I've heard that putting coconut oil on your hair and letting it sit for a few hours before washing can help. So over the last few weeks, I've been giving that a try. It's slowly working and my hair does feel a little softer. Have any of you tried this? What tricks/tips do you have for dry, damaged hair? These shorts are seriously cute!! I love this! Beautiful look! Love your shorts!! These shorts are soooo cute! Love the shorts! So fun and pretty!